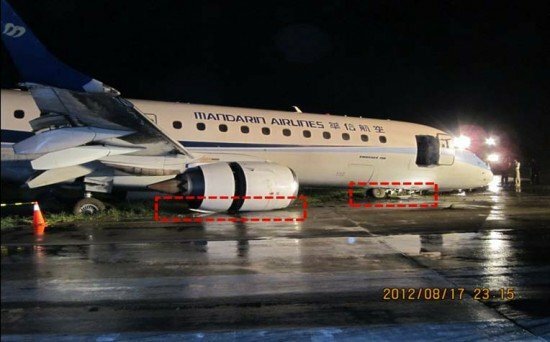 Taiwanese accident investigators reported that the crew of an Embraer ERJ-190 did not apply the best deceleration procedures after landing long on a wet runway, leading to a runway excursion and nose gear collapse. On Augst 17, 2012, a Mandarin Airlines Embraer ERJ-190, registration B-16825, departed Taipei-Sung Shan Airport on a domestic service to Magong (also known as Makung). The flight was cleared to land on runway 20. Runway length available on that runway was 6890 feet and the runway surface was wet. The airplane crossed the runway threshold at an altitude of about 22 feet. It descended slowly, touching down on the main wheels at 2830 feet past the runway threshold. The flight crew felt that the deceleration was not what they expected and intentionally steered the plane to the left side of the runway. Just prior to reaching the runway end, they steered the plane onto the grass. The nose landing gear was ruptured and fuselage skin was damaged due to colliding with the concrete base of four taxiway lights. The airplane sustained substantial damage but there were no injuries to the 104 passengers and six crew members. During landing phase, the flight crew early flare the aircraft, did not timely retract the thrust lever to idle position. The flight crew continued holding to the control column and did not initiate a go around or reject landing after the aircraft landed beyond the touchdown zone. After landing, the flight crew did not apply the best deceleration procedures, incorrectly considered the aircraft encountered hydroplaning and intentionally controlled the aircraft out of the runway to the grass field when approaching the end of runway. The aircraft hit the handholds of the taxiway edge lights during landing roll and damaged the nose landing gear. This accident also highlighted the need for airports to follow the rules and recommended practices of ICAO Annex 14 ‘Civil Aerodrome Design and Operation Standards’. At Magong measures should be taken to prevent an aircraft wheel from striking a hard vertical face in the case of a runway excursion. Magong Airport also has an uncovered ditch, 85 meters from runway centerline, parallel runway 02. The Aviation Safety Council (ASC) issued seven safety recommendations.